Yes, for real! Urine is an excellent homemade fertilizer for plants and soil. It’s amazing how many nutrients we flush down the toilet every day. Phil: Hey guys it’s Phil from smilinggardener.com. If you haven’t checked out my free online organic gardening course, you can do that right on the homepage of smilinggardener.com. Today I am talking about homemade fertilizer, now I don’t mind buying the occasional fertilizer for my garden if I know it’s gonna really help and prove garden health but I also really like to use fertilizers that I can make or scrounge from around my property because it’s a lot more sustainable and it’s free and so today I am, what I am gonna be doing is sharing just two, there are many different things you can use but what I want to do is focus on two that pretty much everyone can use in their garden. The first one is urine and I know it sounds kind of crazy but this is a really important one, so here is some of my urine which I know is really gross for a lot of people but I want to make an important point here, by the way molasses is also really good in the garden, but today I am talking about urine. Urine is nontoxic, and actually urine is not really all that yellow, may because of the sun yellow today but if you are drinking enough liquids urine becomes much more clear but I really want to get across is that if you are reasonably healthy person, urine is not toxic and I am gonna show you that by pouring some on my hands which probably gross some people out and I apologize for that but what I want to show you, you can drink urine if you have to, not something I am really interested in doing but urine is not toxic, it’s not a place where all of your toxins go in your body. Urine is such wonderful stuff, I have read that it basically has on an average I am sure varies a lot but somewhere around 11 g of nitrogen, 1 g of phosphorus, 2.5 g or potassium and I am sure has other nutrients that your body didn’t use as well especially if you take supplements and multivitamins, you may have heard someone say you are just peeing all of that money into the toilet, that’s not entirely true, you get some of it but you do pee some of it, so that’s gonna be in here too. So, it’s a very nutritious thing, of course it’s a little easier for guys to sprinkle a little bit of urine around in the garden here or there or maybe talked away in a private spot. One reason why it’s really nice to put a compost pile maybe in a corner somewhere and you can go and pee in there because it’s really great to do in the compost pile but otherwise what you can do is, I mean you can pee right in the garden too, otherwise you can pee in something like this and then you can go and use that to water your plant. Now if you are watering your plants directly, you want to mix it with 20 parts of water, so yeah 20 times as much water as urine but otherwise you can go pee right in your soil and on your mulch around your plants without too much trouble. The best thing to do would be to flush your toilet out into your compost pile or into a wet land you have created to handle all of that and to recycle all of that. One of the main problems there is that many bylaws don’t allow for that but if you live in a place where you do it’s a great way to just recycle all of that stuff and bring that nutrition into your garden instead of sending it into the sewer system. I did some math once and I am not sure how accurate it was but I figure that if you just peed or applied urine to 10 square feet of garden twice a year, you are applying a lot of the nitrogen needs of the garden. I am not sure exactly how accurate that is but I figure I mean if I pee on each of these trees ocne a month that’s plenty of nitrogen for those trees. So that’s urine, it’s not gross, it’s totally awesome, so start peeing in your garden. The next thing on my list that pretty much, anyone can do as long as long as you have some grass clippings and some weeds around, it’s great something called a herbal tea and what you do is you take all these herbaceous plants and put them in a bucket with water and ferment them for a few days to a couple of weeks. Any kind of weeds and grass clippings will do, it’s specially nice if you have some nutrient accumulating weeds such as dandelions are pretty good, comfrey, yarrow, stinging nettle. I don’t have most of those though so I just use whatever I have. I do have a couple of legumes, vetch, and clover, which I also like to include but I have, something I have most is just this garlic mustered which I don’t think is the most nutritious weed but of course it has nutrition in it. 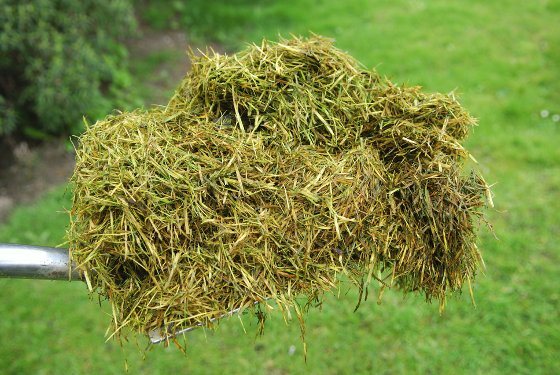 I have grass clippings, they have nutrition in it. so all of those can go in there and what this does is it gets the nutrients off the weeds. It also gets the beneficial microorganisms off the weeds. We put in here, we ferment them and so it becomes this kind of fermentation like you to ferment yogurt or beer or something like that and it becomes this kind of nice tea, we can apply to our plants. Now it’s entirely optional but if you happen to have any kind of microbial inoculants like EM which is what I use often and bio-stimulants like rock dust, some kelp, sea minerals, any of that stuff I often talk about, you can put them in there and you don’t have to because I am trying to make this a homemade video, you don’t need that stuff, but it just makes them even better tea, dandelions and some oats, some garlic mustered, a bit of vetch and clover, a bit of grass clippings, water, water, now that is full of water I need to cover it because this is more of a fermentation that I want to do without air. I don’t have a lid but this is actually kind of cool because if I put it in here I can push down, it will spill some of the water but I am making sure there is really no air in there now and I am just going to let this ferment for a couple of weeks. It might smell a little bit but if I keep it covered it should be okay. If you have a lot of weeds, you can do this in a much bigger bucket too and then when are done after a couple of weeks, you can just water your plants to give them a nice amount of broad spectrum nutrition and some beneficial fermenting microorganisms. So those are two of my favorite simple, everyone can make a homemade fertilizers. If you have any questions about homemade fertilizers you can ask them down below, if you haven’t signed up for my free online organic gardening course, you can do that down below and you can also join me and my sister over on Facebook at facebook.com/smilinggardener. And while we all know that poop, aka manure, can have soil-building benefits, an average pee contains something like 11g nitrogen, 1g phosphorus and 2.5g potassium, give or take of course. So it’s a great homemade nitrogen fertilizer, but it also has the P and the K and no doubt some trace minerals, too. If you’re healthy, there’s nothing toxic about it, though the smell may keep deer and other animals away. Of course it’s easier for guys to sprinkle the garden directly than for women. Cultural norms may be shifting but it’s probably still considered a bit odd to whip down your britches and squat right in your backyard, at least in the suburbs. That’s why it’s nice if you have a compost pile in a hidden spot, because that’s the best place to do your business. Or you can pee in the garden, too, which I often do. Just make sure you don’t pee right on your plants – ever notice how certain shrubs or patches of grass in dog parks turn yellow and die? It’s not a great homemade lawn fertilizer, that’s for sure – unless you dilute it first. You can pee in a bottle or bucket, dilute it 20:1 with water, and then feed the plants or your lawn directly. Here’s another homemade fertilizer for plants that everyone can do as long as you have some weeds or cover crops or even grass clippings. Take any combination of herbaceous plants, put them in a container, fill with water, and cover with a fairly air-tight lid. Leave it for a few days to a couple of weeks or months, and you have a herbal tea. Especially if you leave it for long enough that the bad smell mostly goes away, the resulting brew will contain many nutrients and beneficial microbes from the plants. You can add inoculants such as EM and biostimulants such as sea minerals to sweeten the deal, but that’s not necessary if you don’t have them. This will be most effective with plants that are nutrient accumulators, like comfrey, yarrow, or stinging nettle, but all plants contain nutrients. And some plants such as horsetail or chamomile have specific properties that repel pests or fight pathogens, so they’re nice if you happen to have them. But I often just use clover and weeds and some grass clippings for this homemade garden fertilizer. Nice to keep it simple. Any question about this? Any homemade fertilizer recipes of your own you’d like to add? Let me know below. Love this! Posting on my business facebook…(Synergies For Health)-(three words not two) I have shared a few of your videos!!! Where do u find rock dust? It can be hard to find, and a bit expensive, but I think it is worth getting your hands on. First try a good hydroponics store in your area. Yes, comfrey is wonderful for this. Good job. “Compost tea” can refer to a broad variety of techniques, see my reply to Andrea below. For AACT’s and most other kinds as well, you should use your compost tea as soon as you can after brewing. When the good microbes in the tea run out of food or oxygen “bad” anaerobic bacteria will begin to dominate the tea. Use it before you lose it. Since nothing in your tea should be a threat to your plants, see Phil’s other videos for an easy AACT recipe, dilutions are not critical. Any microbes your soil cannot support will harmlessly die off, so it is really about getting the most bang from your compost tea buck. I usually go about 5 to 1. In teas like Phil’s above that ARE intended as fertilizers, it is rare to accumulate enough nutrients to burn your plants. Dilute using color and smell as indicators. Unless you have a ppm meter, just use your intuition. Keep on brewin. Erik is right again (thanks Erik!). If you’re asking about aerated compost tea, it should be used right away while the beneficial microbes are still active. This herbal tea above, on the other hand, will probably last for a long time. I like to dilute it 1:10 or 1:20 with water. AACT’s (actively aerated compost teas) are mostly intended to supply and feed the microorganisms in the soil. Usually they are made with very little Nitrogen and are not technically “fertilizers”. Phil’s tea in this episode, on the other hand, IS intended as a source for feeding the plants directly. The (non- Bokashi) anaerobic bacteria created in his method will mostly aid in the decomposition of the plant matter, and won’t multiply enough or survive long enough to cause any harm once they are exposed to oxygen. If, however, the tea smells like vomit, it HAS accumulated too many harmful byproducts from anaerobic metabolism, and should be discarded. Erik has said it right. Compost tea is for the microbes; herbal tea is for the nutrients, and also for a different class of microbes which are “anaerobic” and actually do provide some benefits, although for the most part, I focus on the aerobic microbes in compost tea. I have chickens and use straw in their coop which I collect and compost. Could I add that to the tea without burning the plants? Yes, it’s great, assuming you balance all of that Nitrogen with Carbon sources (leaves, straw, sawdust, paper) and let the composting process finish (if you are hot composting, a month or two). And, that means green leafys, grass, ash?? and wait for the compost to sit for a year???? It’s true that we mostly want to encourage aerobic microorganisms, but there are potentially some benefits to applying anaerobes, too. I actually do like to add EM to my herbal tea because it is full of facultative anaerobic microbes that should encourage the microbial population in the tea to be mostly beneficial. So I’m unclear, do you use the liquid or the matter after a couple weeks? Or both? Liquid for the garden and matter for the compost? Exactly. We’re mainly going for the liquid, but that matter should go into the compost after, or just on the soil as a mulch. Hi Phil and thanks for all your great instructions.I have been composting my human waste for over a year now and I am very happy to hear of others talking about it. I live in CA and have gophers and I started saving my pee and pouring it down the gopher holes to see if I can deter them from being around my garden. Not sure yet, but I am obviously adding lots of nutrients to my soil as well.I also compost my poop using red worms which works very well and I would encourage everyone to do this as it recycles a great resource and saves lots and lots of drinking water as our toilets mostly and wastefully use drinking quality water for flushing.I have written to my congresspeople and local water district to ask them to support the use of composting toilets to save water and recycle good resources. HOw do I post this? Excellent. Glad to hear about what you’re doing. We really do need to start recycling our own manure in a healthy way, as we need those nutrients. I’m not sure what you mean by ‘how do I post this,’ but feel free to clarify. I’m a supporter of recycling human manure but never directly to the garden. Much better than pumping it out to sea. Apart from the risk of spreading decease, many organic, tribal and spiritual beliefs, would never defecate on their food plate, table or garden. Some sort of energy thing going. I tend to agree with this so I like to put it through, at least, 2 composting cycles before it is ready to go back on the garden. Just look how using human body waste has f**ked up the soil in some parts of China. And some say, was a part reason some ancient civilizations collapsed. Yes, definitely should be composted well or run through some kind of biological system that cleans it up. Really want to do this. I’m interested to see what you think about adding already composted cow manure or chicken manure to the tea. Good question. Manure tea has been made for a long time. I bet there are some benefits. But it can also introduce harmful microorganisms which may then populate the tea. I haven’t studied anaerobic manure teas much so I can’t really give a solid answer here. Yes, nettle fertilizer is a good choice. Other than that there’s really no 1 magic bullet fertilizer for a lawn, as it depends what your lawn is deficient in. I really like at least monthly applications of effective microorganisms and liquid fish or sea minerals fertilizer. The fish isn’t as sustainable, but can be very useful. Ive heard you say you can use Coca-Cola for fertilizer. Do you have to dilute it down or do you use it straight? Whats the mixture if so. I say one can of Cola per 1000 square feet, mixed in as much water as you need to spray it out there. If you were watering containers, I’m not sure – maybe dilute it 1:50 and water weekly (my go to ratio for a lot of stuff). Hi Phil,I just made up a batch of Herb Tea in a five gallon bucket with a smaller bucket filled with water on top. After about a week or so I bumped the bucket and a bit of water spilled and a very foul smell was emitted. Is this normal?So is this herbal tea still usable? I don;t have EM as I am new to all this type of gardening and haven’t found a source locally in US.One thought is that we live in FL and it has been quite hot lately so the bucket of tea would be quite warm as It is outside.Thanks for any thoughts and suggestions you have. Yes, this kind of tea is anaerobic, so it can smell pretty bad. Nothing to worry about. Yes, for sure, you can bury them and they’ll break down. Sure, it’s not a bad idea to put it out there. That little amount of salt won’t be a problem – would even be helpful if your soil is low in sodium, but only a soil test through a lab will tell you that. thanks for the reply! I’ll try it as an additive to my fermented herb tea 🙂 will post if anything noteworthy takes place. I am in the process of making the herbal tea with various weeds as well as some water kefir and a jar of kimchi that was too sour for me. Will give an update with how it turns out! Ok so finally starting to make weekly batches of nettle/comfry tea in sealed containers – now when it comes to application would you use it as a foliar spray? e.g in the Rittenhouse sprayer? Yes, foliar and soil. These kinds of teas are often mixed with 10-20 parts water before spraying on leaves. I have been collecting all of my urine for over a year now. Mostly I poor it in my compost pile but sometimes I mix it with water and fertilize my plants. I started collecting humanure too. Hi Phil, thank you for sharing these videos! I would like to ask you if I can make homemade fertilizer using plants with seeds on them? Will those seeds germinate around the fertilized plants? I know the seedless plants are the best or the filtered, but some seeds are very-very small! If you let them soak for a couple of weeks and the mixture ferments, many seeds will become unviable. That being said, no doubt some types of seeds will survive and germinate. As to which ones, I’m not sure. Hi Phil, thank you for your answer! I love your work,I was thinking to make my own home made liquid Fertilizer using nettle,egg shell,banana skin,lentils and lime! Sure, there should be some benefit to making a tea out of those things.